Cooling is an important factor to consider when you buy a new graphics card. 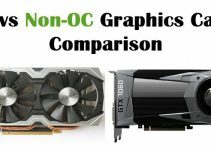 This is because there are different types of coolers available for graphics cards and each one has their own pros and cons. 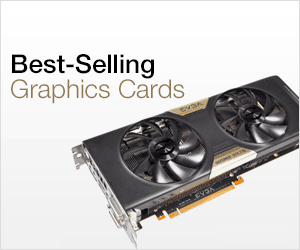 Graphics Cards does lot of heavy graphics processing work and during this it can get very hot. So to cool down GPU, graphics cards are fitted with coolers that dissipate heat from the GPU. 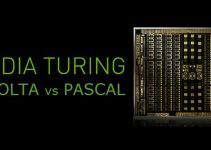 They can be very simple to very complex in design depending on the size of the card and GPU processing power it possesses. Besides GPU there are some other important components too that gets very hot and also needs to be cooled down. These components include VRAM or Video Memory and VRM or Voltage Regulator Module. Video Memory and VRM can also get very especially in a mid-range to high-end graphics card and they also need to be cooled down, otherwise your card may fail, freezes in the middle or it may reboot your PC. Here in this post I am going tell you about the various types of graphics card coolers and also list their advantages and disadvantages. Here are various types of cooling solutions or technologies employed to keep graphics card temperature to safe levels. This is the most basic and simplest type of cooling used in graphics cards. In this type of cooling only heatsink is used to cool the GPU and other components including Video Memory and VRM. This is known as passive cooling because there are no active components involved in cooling process. It is also called fanless cooling and is completely silent in operation. 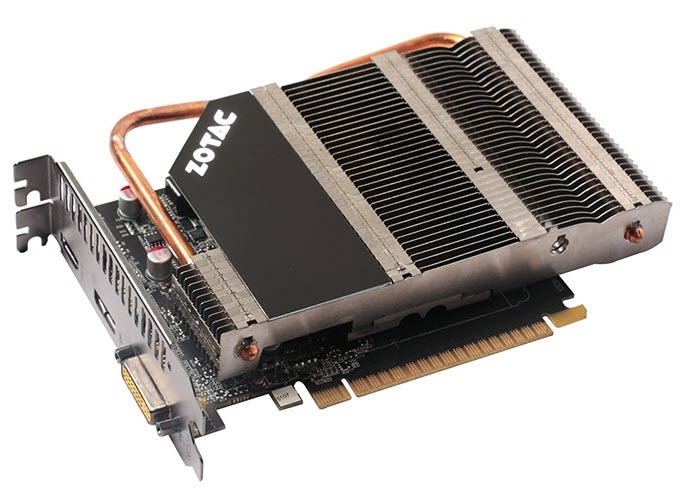 Passive Cooling is generally employed for low profile and entry-level budget graphics cards because GPU of these graphics cards is not very powerful and does not generate that much amount of heat. 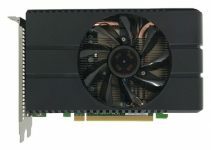 You may also see some of the mid-range graphics cards with passive cooling having bigger heatsinks and copper heat pipes. But they are very few in number and are not popular among gamers. They are mostly used in building a silent PC or HTPC where noise is a bit of concern. The main disadvantage of passive cooling is that it has limited performance and it is very difficult to cool down high-end and faster graphics cards with it. Also never think of doing overclocking on a graphics card with passive cooling because you may end up frying it or damaging it permanently. This is the most widely used cooling solution used for majority of the graphics cards. In active cooling a fan is used with heatsink to cool down the graphics card and this combo is known as HSF or Heatsink Fan. This type of cooling is used on many graphics cards ranging from budget-end, mid-range and high-end graphics cards. The number of fans on the graphics cards depends on the manufacturer and the card itself. Some graphics cards come with single fan, some with dual fans and some with triple fans. In general more fans means better overall cooling performance and better overclocking capability. The speed or RPM of the fan in graphics card is controlled automatically by the graphics card. If the graphics card is at idle or has lower temperature then the fan speed will be lower and during heavy work or gaming the fan speed is bumped to maximum value giving the maximum performacne. You can also control the fan speed manually using good overclocking softwares. Also you can tweak other settings of the graphics card using these tools. 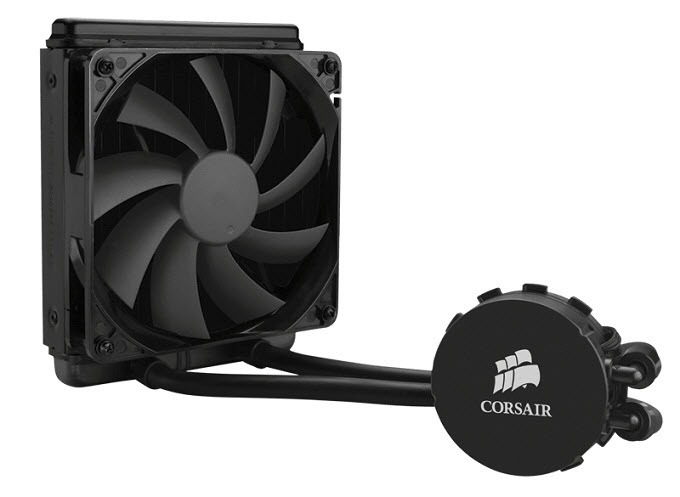 The main disadvantage of active cooling is that it can get very noisy sometimes when fans spin at higher RPM. This is may not be of any issue for the gamers but for those who want to build a silent PC. This is the best cooling method to cool down the GPU of the graphics card. In water cooling GPU of the graphics card is cooled down by a water cooling unit that consists of a radiator and a fan. In this type of cooling, water or liquid is circulated through the GPU surface using pipes and radiator, and the hot liquid running through the pipes is cooled down by the radiator fan. This process goes on repeating and it keeps the GPU temperature much lower as compared to active cooling and passive cooling solutions. Other components such as VRAM and VRM are cooled down by the heatsinks passively. Water Cooling is expensive and requires maintenance time to time. The liquid or water has to be topped up or changed at regular intervals for its proper functioning and for delivering best performance. Water Cooling may get risky because if somehow the liquid starts leaking then it may cause damage to other components in the PC. Note: You won’t find Water Cooling Unit alone on modern day graphics cards because it is accompanied by Heatsink & Fan (HSF) for cooling of Memory and VRM. This is called hybrid cooling. Hybrid Cooling is a form of water cooling where the GPU is cooled by water / liquid cooler and other components like Video Memory and VRM are cooled actively using heatsink and fan assembly. This type of cooling is very efficient and it can really lower down your graphics card temperature to 20 to 30 degree Celsius or even more. This is unarguably the best cooling solution available to cool down your GPU and other components. It is also great for users who are serious overclockers and likes to overclock their graphics card to much higher frequencies. 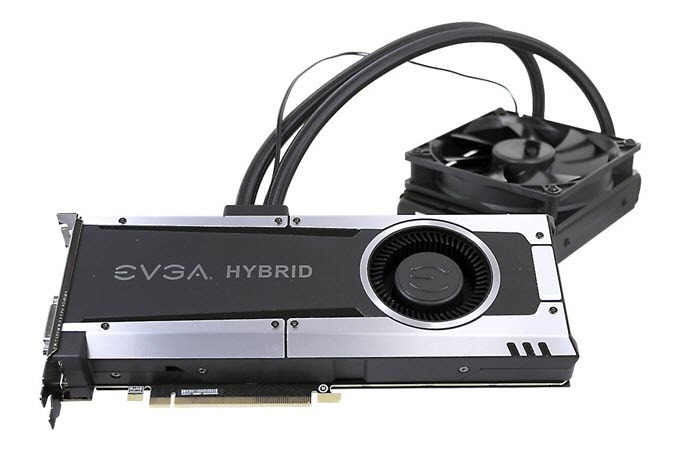 Hybrid Cooling is very expensive and is generally used in the high-end graphics cards, but you can also purchase aftermarket hybrid cooling kit for your reference graphics card. This is a variation of water cooling where the graphics card comes with a custom water block unit having copper base plate that is spread all over the graphics card PCB. In this type of water cooling all the major components i.e. GPU, Video Memory and VRM are all cooled by water. The special liquid / water flows through the water block and removes the heat from copper base plate. It is the best type of cooling that can be employed to cool down graphics card and is also better than hybrid cooling. You can say that it is pure water cooling solution for all major components of graphics card. Also it is much quieter compared to fan based cooling. This type of cooling comes without radiator and you can hook up any standard radiator of your choice to the Water Block Cooling Unit. Water Block cooling is found only on high-end graphics cards such as GTX 1080. 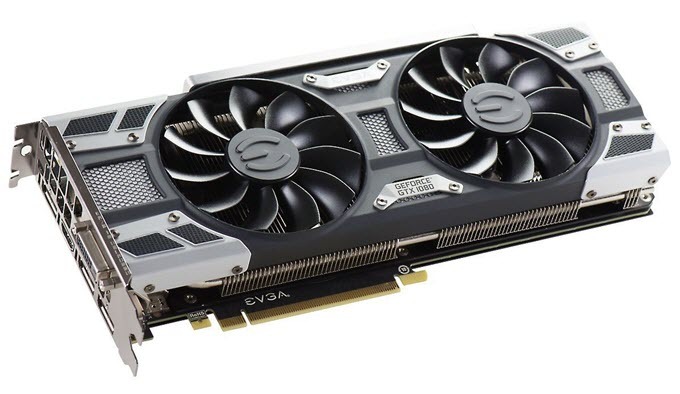 EVGA and Gigabyte are the two manufacturers that employ water block cooling in GTX 1080 graphics card. 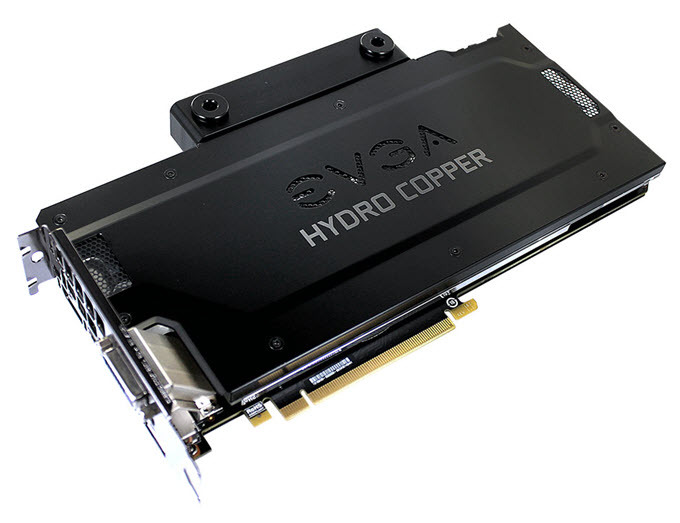 EVGA calls this Hydro Copper and Gigabyte calls it WATERFORCE Water Block cooling. 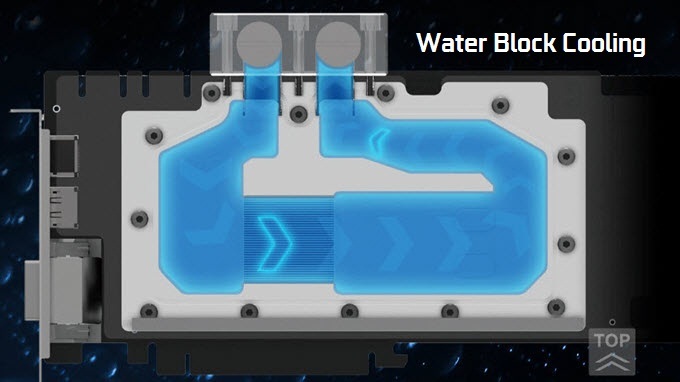 MSI also offers Water Cooling solution and calls it as SEA HAWK EK. For Water Block graphics cards you have to install a water loop and radiator for them separately (Water Cooling Kit). Important Note: Water Cooling and Hybrid Cooling is also an Active Cooling Solution because of involvement of fan and radiator that works on electricity. Here I have listed down all types of graphics card coolers with their pros and cons. Each cooler has it own advantages, disadvantages and usage. If you have any query regarding them, then you can ask me by leaving a comment below. Do you have any knowledge or opinion on the Alienware Graphics Amplifier?